John Murray was born in Aberdeenshire, Scotland in 1809 to a farmer. At the age of 15, he went to Marischal College and then continued his education at Edinburgh University, where he graduated in 1831 (wiki.phalkefactory.net/index.php?title=History_of_photograph_in_India, accessed: 10/03/2016). In 1833, Murray began working for the Medical Services of the East India Company as an assistant surgeon (ibid). I could not find where Murray was stationed when he first went to India. However, he moved to Agra when he was appointed the Civil Surgeon of the city in 1848 (www.independent.co.uk/news/first-taj-mahal-photographs-expected-to-fetch-pounds-500000-1098382.html, accessed: 09/29/2016). 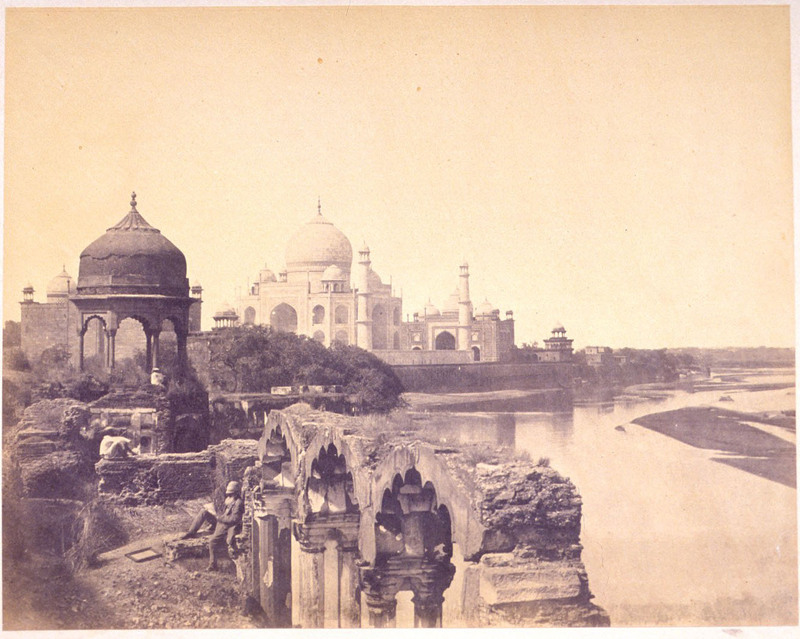 The year after arriving in Agra, Murray took up the art of photography. In addition to having an interest in photograph, it is known that Murray had a fascination with the Taj Mahal. He would show visitors the Taj Mahal and his favorite time to do so was after dark in the moonlight (www.independent.co.uk/news/first-taj-mahal-photographs-expected-to-fetch-pounds-500000-1098382.html, accessed: 09/29/2016). Though he began making photographs in 1849 he did not make the first photographs of the Taj Mahal until 9 years later in 1858. He made multiple views of the Taj, however, most of them are not what is now considered the classical view. From my perspective he seemed keen on photographing the Taj with other visual information, especially the rivers edge (which you see examples here). In addition to the Taj Mahal, Murray photographed the other Mughal monuments in Agra and around Uttar Pradesh, as well as, Delhi. It seems so weird now that it took almost 20 years from the announcement of photography’s invention for the Taj Mahal to be photographed. Today, between 2 and 4 million people visit the Taj Mahal each year, so the number of photographs must be exponentially more. However, I guess it is important to remember what it took to make a photograph in the late 1800’s. Murray work with a 16 x 20 inch view camera (see below). This means the negative itself was that big. He had to carry his camera, negative and equipment to the site where he wanted to photograph. He also used both glass plate negatives and wax paper negatives. You can imagine that carrying around pieces of 16 x 20 inch sheet glass would be cumbersome. This is a very different experience than the one we have today where our camera can be as light as our cell phone. It is mind blowing to think of how the Taj Mahal was built between 1631 and 1648, subsequently it was virtually abandoned for some time, then began being visited by the British, and now it is one of the most recognized building in the world. John Murray will always be etched in both photographic history and the history of the Taj Mahal. He spread his love of Mughal architecture and the Taj Mahal in particular through his photographs. It is through this interest that the rest of us know the Taj Mahal. It is often thought that all possible photographs have been made. Certainly millions or billions of photographs have been made of the Taj Mahal, however, I hope like Murray others continue to visit the Taj and photograph it with love. For some perspective. 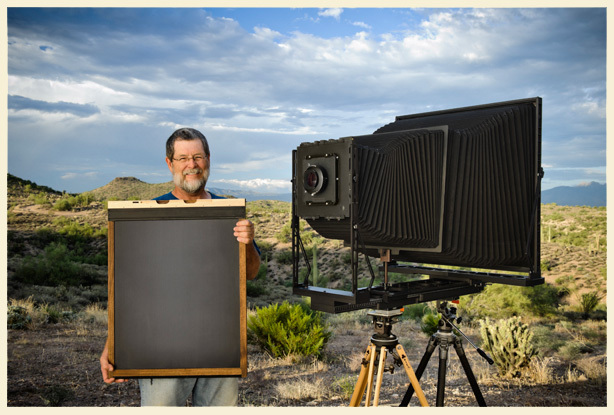 This is photographer Keith Canham standing next to a 16 x 20 inch view camera. The object he is holding in his hand is the negative holder. That means the negative is as large as the black surface of the negative holder. I hope you enjoyed Taj Mahal week! See you next week with a new exciting group of posts!